With the recent small-plates / no-bookings fad that’s taken over London’s restaurant scene, the humble neighbourhood restaurant that serves up reliable, good value food has become increasingly few and far between. Someone needs to bring well-executed, Modern European cuisine back into fashion. Thankfully, they now have a champion in Medlar. Medlar is the sort of place that reminds you that food doesn’t need to be cutting-edge or gimmickey for one to have a stonkingly good meal. 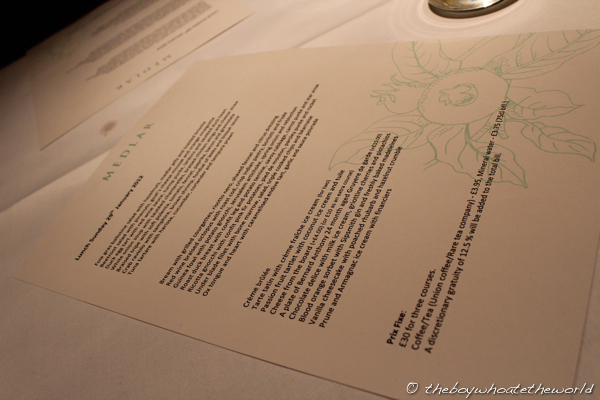 Their elegant Prix Fixe menu tells the story of the philosophy here. Gone are the little plates that often leave you with hunger pangs past midnight and cost so much more in total…it’s a return to the good ol, retro 3-course meal here (£39 quid for dinner, an even better value £30 for weekend lunch). Gone is the business of having to queue uncomfortably by the doorway at the mercy of other diners for tables to be turned… you can book online at the simple click of a button. And with a team who have honed their cuisine and charm in some of London’s finest treasures ranging from Wandworth’s Chez Bruce to the double-Michelin starred The Square, expect an impeccable, smooth-sailing meal (that’s if you can make your mind up on what to order given how delectable every dish on the menu sounds…). 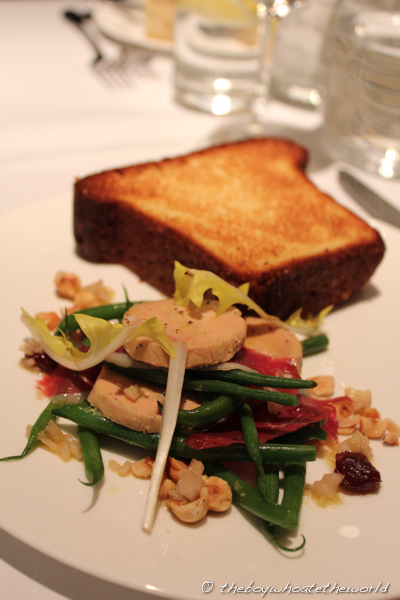 My Foie Gras Ballotine Salad was as fresh and tasty as it looks. The french beans were perfectly cooked… still with a little bit of crunch and dressed in a light, zingy vinaigrette. Then came layer after layer of flavour… first the savoury meatiness of the Iberico Ham… then the rich, smoothness of the foie gras …and finally the quince-like sweetness from the Medlar jelly. You gotta love that brick of a Toasted Brioche on the side as well! Too often I’m left brioche-less towards the end of a first course. No austerity this time. 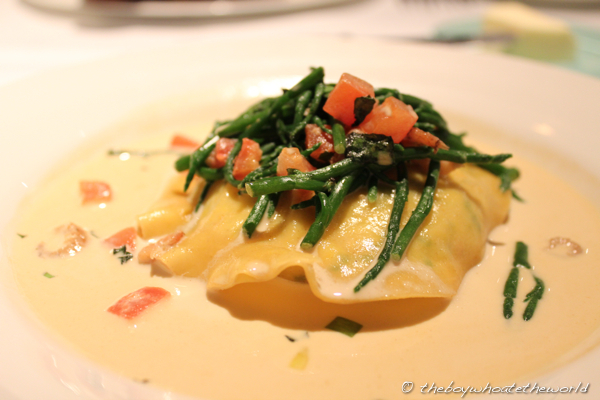 Jo’s whopper of a Crab Raviolo was just as excellent. The bisque-like fondue sauce was the money. Despite it’s creaminess and depth of flavour, it was still relatively light and balanced – not overwhelming the fresh crabmeat, samphire and brown shrimp. Dee-licious. There are few places in town where you will find such well-cooked fish and both our Main courses were testament to this. 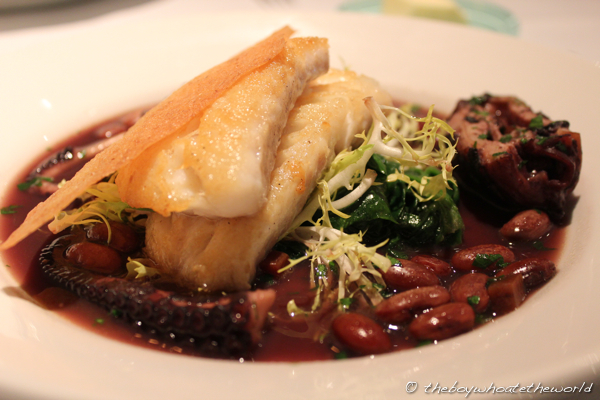 The execution of Jo’s Roast Cod and Braised Octopus dish was faultless. The light, red wine broth and Borlotti beans were comforting and nourishing at the same time. The chunks of flaky, succulent Cod and tender yet meaty octopus when eaten altogether with the crunch of the poppadom-like pastry was something else. Mmhmmmm. My seabream was again cooked to clinical perfection. The skin browned and wonderfully crisp. 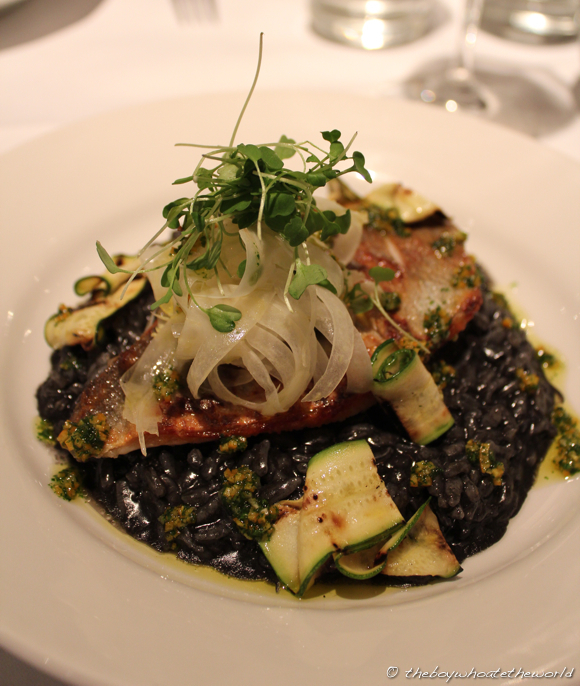 Zingy citrus gremolata and their lightly pickled, shaved fennel helped to cut through the richness of the squid ink Risotto very well indeed. Wholly satisfying on the whole, but if I had one criticism, it was that they were a little over-zealous in the olive oil department. I would have preferred just a little drizzle (not the mild dousing that I ended up getting). Suckers for anything with Blood orange on a menu, the better half and I broke from tradition and opted for the same dessert course. 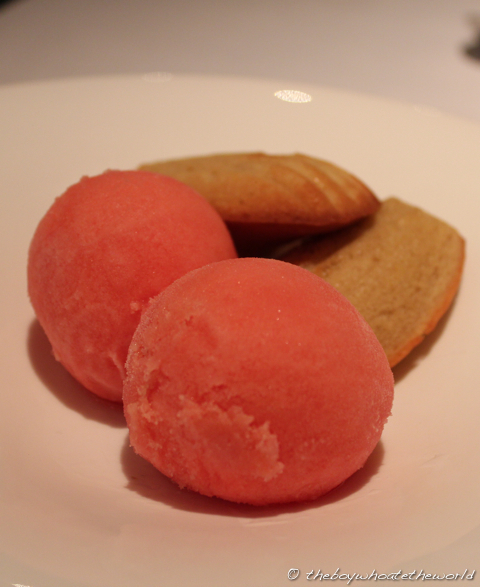 I thought the powerful shot of Gin in the dish worked wonders with the sweet, sharp and mildly bitter kick of the Blood Orange sorbet. The Madeleines were pretty fabulous as well… deliciously buttery and served toasty warm, it was a real treat and a fresh, clean end to a quite superb meal. At £30 a head, it’s some pretty sensational value for the quality you are getting. If there was one bum note to an otherwise faultless experience, it was our luck of being sat a couple tables down from an OTT, drama queen of a past-her-prime-WAG who was set on declaring her life story to the entire restaurant. Guess there’s no escaping the occasional hazard of dining in Made-in-Chelsea territory. At least Medlar’s food seemed to give her something to cheer about. And what’s not to cheer. It’s easily one of the best new restaurant openings London has seen in the past year and a place SW-ers can rely on for solid Modern European cuisine at its very best.